Do you know how to create a hyperlink in a cell in one sheet to a specific cell in another worksheet in the same workbook? By doing this, you can quickly navigate to specific cell of another sheet by clicking the hyperlink in Excel. 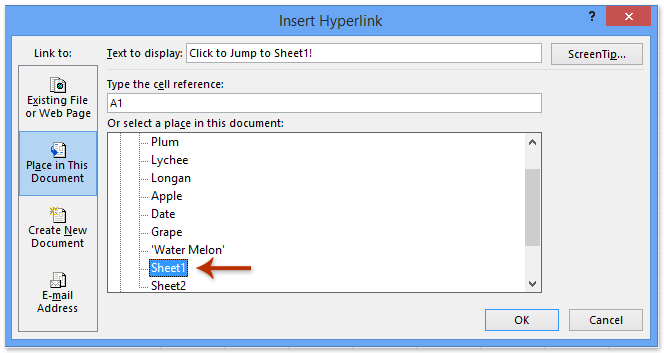 The hyperlinks will help you switch to the other worksheet and locate specific cell quickly. Here are two tricky ways to create hyperlinks to specific cell in another worksheet in the same workbook. 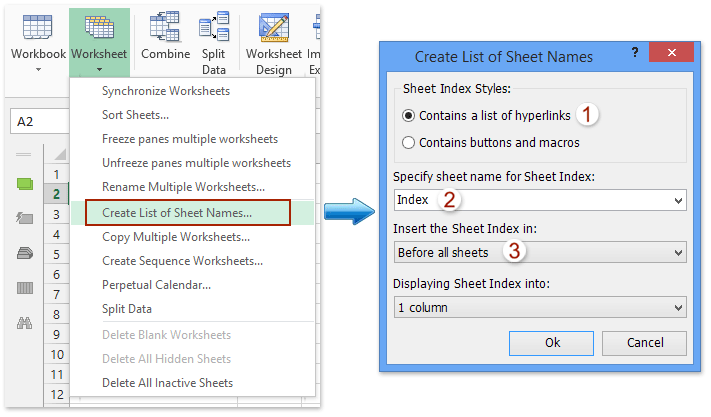 Normally we can insert a hyperlink to one sheet in one cell by Insert > Hyperlink in Excel. 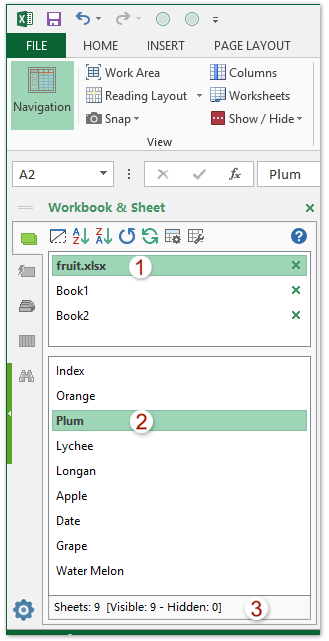 But, with magic Create List of Sheet Names feature of Kutools for Excel, we can quickly insert multiple hyperlinks or macro buttons to each worksheet of active workbook. Full Feature Free Trial 60-day! This Create List of Sheet Names utility also supports to batch insert multiple macro buttons to go to each worksheet (or other worksheets) in current workbook. Actually, we can make hyperlinks to other worksheets with Hyperlinks command easily. 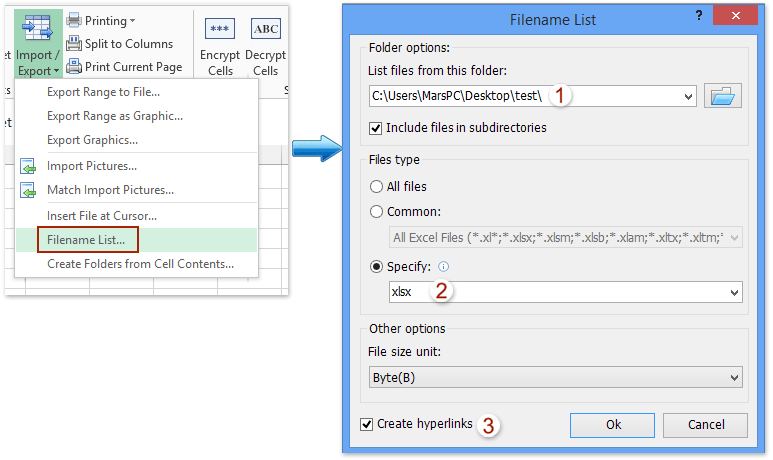 (4) If you want to hyperlink to specific data in the sheet, please specify the cell in the Type the cell reference. (3) Show the total number of sheets. If you want to create one hyperlink to each worksheet in one sheet of the same workbook, you may need to create a hyperlink for each worksheet again and again. But with Kutools for Excel's Create List of Sheet Names utility, you can quickly create a hyperlink for each worksheet in one worksheet quickly. Kutools for Excel's Create List of Sheet Names tool can create a list of all worksheet names of the active workbook in a new worksheet, which contains hyperlinks or macro buttons for quickly navigate to other worksheets. 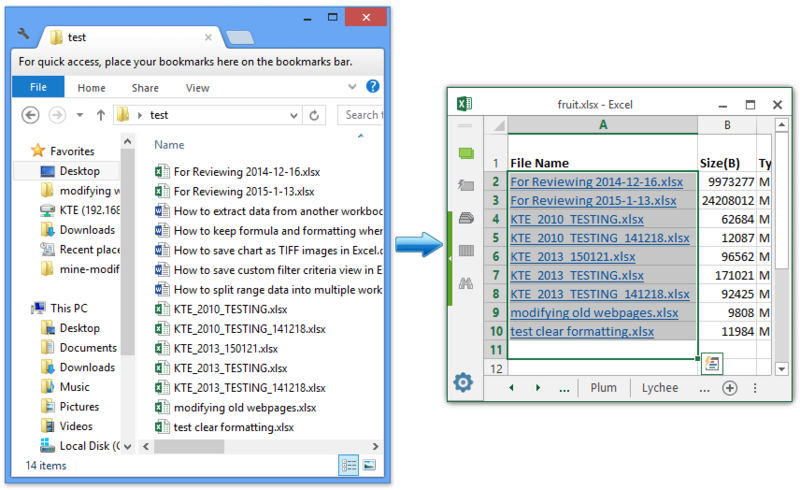 Kutools for Excel’s Filename List utility can batch add multiple hyperlinks to all files or one type of files in a certain folder, such as create hyperlinks to all workbooks, to all word documents, to all text files, etc. 1. Click Enterprise > Import / Export > Filename List. In this Video, the Kutools tab and the Kutools Plus tab are added by Kutools for Excel. If need it, please click here to have a 60-day free trial without limitation! For removing multiple hyperlinks in a selected range, Kutools for Excel’s Delete Hyperlinks utility can help you archive with just one click. This utility can also delete all hyperlinks in active sheet, selected sheets, or active workbook with just one click. Full Feature Free Trial 60-day!